The heroic archetype Superman embodies in our world, is manifested by similar heroes who operate in other dimensions. One such personality is Mr. Majestic. He hails from another Earth, by way of another world beyond terra firma. Yet, Mr. Majestic possesses similar powers and abilities exhibited by the Man of Steel. Majestic can fly; he utilizes super strength; and he has his own advanced senses, allowing him to perceive reality far beyond the scope of normal men. Dressed in a crimson and white costume, Mr. Majestic emerged from the bizarre time storm, just in time to rescue Lois Lane. Because he resembles Superman cosmetically, Lois mistook him for the Metropolis Marvel. As Mr. Majestic would experience, she was only the first to do so. Nevertheless, Mr. Majestic carried on, rescuing several citizens from danger. Eventually, Mr. Majestic encountered S.T.A.R. Labs, John Henry Irons, Steel, Superboy, and The Eradicator. 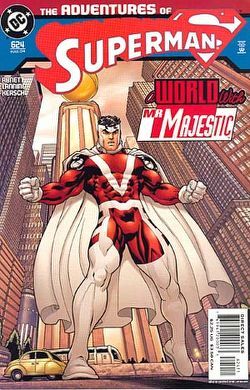 Majestic's personality - that of a highbrowed, rationally calculating, and impersonal figure - put him at odds with the members of the Superman Family. Ironically, the man most at odds with Majestic was The Eradicator, himself a highly aloof personality. Threatened by Mr. Majestic, Eradicator projected the strange visitor into the Phantom Zone. Dr. Irons and the other scientists at S.T.A.R. attempted to save Metropolis by detonating a hyperbomb in the heart of the massive chronostorm. They assumed that the device would disperse the event, and save reality around them. Released from the Phantom Zone by Lois, Mr. Majestic flew directly after Team Superman, and confronted the heroes. He knocked Steel out of commission, and forced Superboy to save her. Then, he battled The Eradicator, and eventually punched him out of sight. Mr. Majestic destroyed the hyperbomb, and managed to save Metropolis. He correctly deduced the storm for what it was: modern reality rejecting the chaotic Brainiac 13 technology that belonged to the far future. His solution: let it ride out, and literally let nature take its course. Appealing to Lois Lane, Mr. Majestic stood before her, and revealed the aftermath of the time storm - a modern day Metropolis. There was no rubble, no sense of damage. What remained was the Metropolis that stood as it should, in the 21st Century. Later, Superman and Majestic worked together to get him back home. In the process, Daemonites came to Metropolis and almost killed Majestic's new surrogate family, who he stayed with because they reminded him of his old family on Majestros. They managed to push the invaders back, and Majestros got back home, only to find everyone gone. He currently endeavors to find them in his own ongoing monthly comic book, which Superman has guest starred in. Originally Appeared In: WildC.A.T.s comics and other publications released by Aegis/Wildstorm Entertainment.